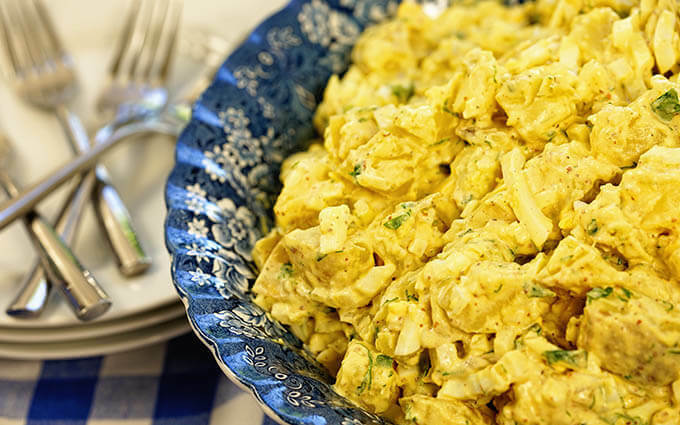 Deviled Egg Potato Salad: easy to make with tender yukon gold potatoes, eggs, mustard, onions and mayonnaise. This is a creamy, classic potato salad recipe perfect for your next BBQ, cookout and great on a buffet! We traveled to Oregon this weekend for the Corliss family reunion. This year it was at my folks house in Scappoose, Oregon. We kept it simple and easy – Dad ordered pizza from a local restaurant and Mom and I made salads. The Corliss side of the family is full of fun and laughter. There is always lots of teasing and silly jokes. That’s my folks in the front – Mom and Dad sitting in the chairs, I’m kneeling down right by Dad. 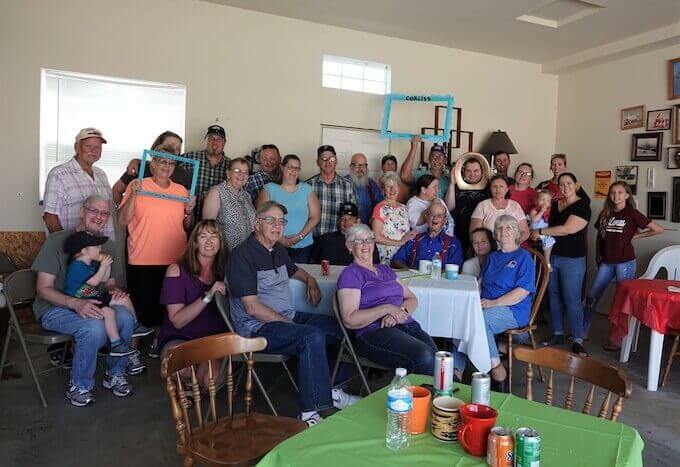 My brother Don (holding up a blue picture frame in the back) and Dan are in the back. Dad ordered in pizza and Mom and I made a couple of salads. 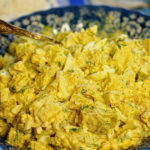 One of the salads I wanted to share with you today is Mom’s recipe for Deviled Egg Potato Salad! This recipe is long in coming, I should have had it on the blog years ago, because it SO. Good! Every BBQ or cookout, this is the first thing gone! Creamy potatoes with a great burst of flavor from tangy mustard, it’s just the best! What potatoes are best to use in potato salad? What kind of seasoning to put in potato salad? For seasoning, my Mom uses just salt, pepper and yellow mustard. I will also add a dill pickle spear and about 1/4 cup of herbs, both finely minced. You’ll love this creamy potato salad! How long do you boil eggs for potato salad? Add the eggs to a large pan in a single layer. Fill with water to an inch over the eggs, add a teaspoon of salt. Bring a boil and boil for 3 minutes. Remove from heat and cover for 30 minutes. Perfectly boiled eggs every time! Did you know older eggs are easier to peel? How long do you boil potatoes for potato salad? Boil the potatoes until they fork (not knife) tender. The time will depend on the size of the potatoes. How do you make deviled egg potato salad? Scrub the potatoes under warm water. Dice into 1/2 inch pieces. Add to a large pot and fill with water to 1 inch over potatoes. Add a teaspoon of salt, bring to a boil. Cook until the potatoes are fork tender, drain well. Boil the eggs, drain well and peel. Refrigerate the potatoes and eggs until they are completely cooled. We often do this the night before. Dice the onion into a small dice. When you’re ready to make the potato salad, Add the mayonnaise to a small bowl, along with the mustard. Chop the eggs and add them to the bowl. Season with salt and pepper. Add the potatoes and onions to a large bowl. Top with the deviled eggs and mix together well. *If you’re adding the optional herbs and pickles, finely mince and add to the salad. Everyone’s favorite classic potato salad! If you’re looking for more great salads for your next cookout – here are some terrific recipes! optional ingredients - 1/2 dill pickle minced, 1/4 minced herbs - parsley, cilantro, dill, etc. - use your favorite! Scrub the potatoes under warm water, dice them into 1/2 inch pieces. Add the potatoes to a large pot and fill with water to 1 inch over potatoes. Add a tablespoon of salt, bring to a boil. Cook until the potatoes are fork tender, drain well. Boil the eggs, drain well and peel. Refrigerate the potatoes and eggs until they are completely cooled. We often do this the night before. When you're ready to make the potato salad, Add the mayonnaise to a small bowl, along with the mustard. Chop the eggs and add them to the bowl. Season with salt and pepper. *If you're adding the optional herbs and pickles, finely mince and add to the salad. 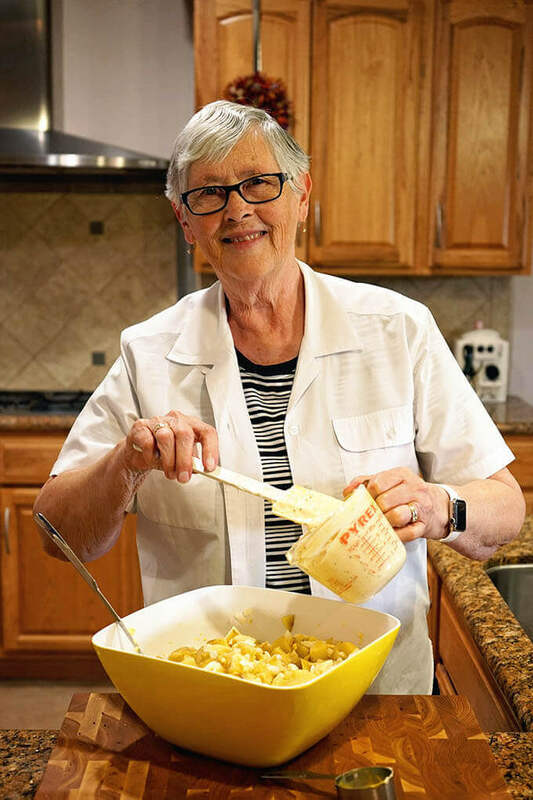 No one makes deviled egg salad better than mom! Your mom’s version looks incredible! I wish I could have been there to try it; family recipes are definitely the best! 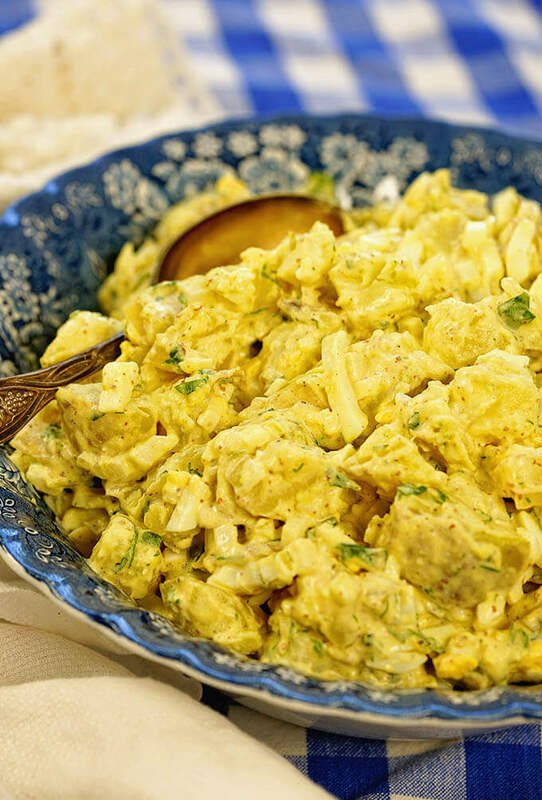 Mmmm, this deviled egg potato salad looks like a great addition to any meal. What a fun filled reunion, especially when you get to make family favorite dishes! The added mustard in your recipe was just what mine was missing! It was just the right balance in the salad…. so I guess I should say…. thanks for my new regular potato salad recipe! Not going back to mine with this one in my pocket! Thank you so much Michele, I love Mom’s recipe! 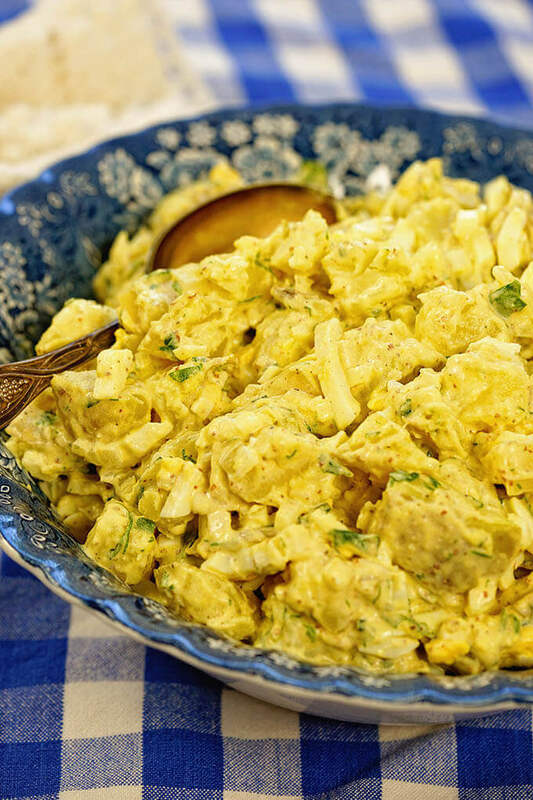 There is no other way to eat potato salad then with TONS of deviled eggs in it!! this looks like heaven in a bowl! Yum, yum, yum – thank you!! I love this potato salad !! Definitely a winner. I made it on the weekend and everyone loved it! Not a single potato piece left! Wonderful, thanks for swinging back and letting me know. I’m so glad you enjoyed this delicious potato salad! !